Exploring the political and geographical changes in postcolonial India, my practice investigates the effects of modernism on the traditional societies, and also the impact it creates on the natural environment. Having grown up as a girl in India, it is not hard to witness the complexities within the social structure in terms of oppression and dominance. The questions of inequality and social marginalization started germinating in my thought process during my growing up years. These fundamental queries later contributed in the formation of my artistic self as the struggles against all forms of patriarchal norms increasingly started manifesting in my artistic practice. Crafted Resilience is a performative and a photographic project that critiques the complexity of women’s position in the modern society. On one side, compulsory education is politically promoted for the girl children in the traditional schools in postcolonial India, and on the other hand, they are continuously dominated to follow the cultural norms that are altered to fit into the modern patriarchal system. These contradicting treatments towards women raise many questions through this project about their rights, dignity, freedom, societal and cultural norms. Crafted Resilience uses crocheting (taught and helped by my mom) with the ‘Janeu’ thread to perform labor, domesticity, and resilience. ‘Janeu’ is a white cotton thread worn across the body from the left shoulder by the Brahmin (Hindu) males of all ages, depicting their childhood, marriage and fatherhood, and reminding them of their virtues and commitments. The complexity of this religious culture exists where on one hand, the three threads also symbolize Goddesses Parvati, Lakshmi and Saraswati, who signify strength, wealth and knowledge, and on the other hand, it depicts their social position of being a male. 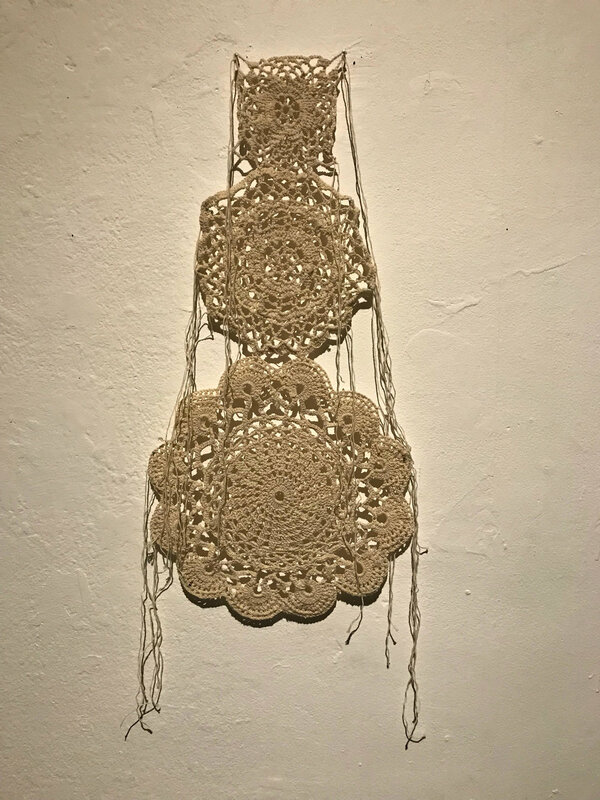 In this work, I use the same thread to crochet between my legs, to not only restrict my physical movements, but also to use the same needle and the thread to create a symbolic protection—an armor for the female body from being immorally abused.